I'm not sure why the state didn't notice a stream at the location of a gas well for which it issued a permit, but Dryden seems to have presented a case in how local officials can find genuine issues the DEC doesn't. This had come up at the January Town Board meeting, and I'm glad to see they got a positive response from the drilling company - who I suspect is aware that their popularity in the area is limited. "There's a question of whether that well will even be drilled," said Jim Oursland, Anschutz's vice president of engineering. "The Cook well is one that we proposed, but we don't have any immediate plans within the next six months of actually drilling that well." I'm very glad that the Town pursued this, especially given the state's attempts to minimize local control over everything related to gas drilling. State pre-emption of local regulation has really bothered since I first heard about gas drilling, and this seems like a step forward on that. We'll see what happens with the actual well, which isn't a Marcellus Shale well, so moved ahead under older rules. In very different news, the SPCA is struggling after a seizure of 100 animals and hopes residents will come in and adopt them soon. Temple Grandin, an autistic professor and advocate for humane livestock handling, will be speaking at TC3 on February 23rd. The tastiest event of the year, the Etna Chocolate Festival, will be this morning from 10:00am to noon at Houtz Hall, on Lower Creek Road in Etna. Tonight from 7:00pm to 11:00pm, there will be a Valentine's Day dance for adults benefiting the Dryden Senior All Night Extravaganza June 25th. This Thursday, February 11th, the New York State Department of Environmental Conservation will be having a meeting on the futures of the Hammond Hill and Yellow Barn State Forests in the Forum room at Tompkins-Cortland Community College. The room will open at 6:30pm and DEC staff will give a brief presentation about the unit management planning process at 7:00pm. These two state forests total more than 5,000 acres. The area between the two forests is Valley Head Moraine, which splits the St.Lawrence watershed (via Cayuga Lake) from the Susquehanna watershed. "At this point in time, Hammond Hill and Yellow Barn State Forests have not been nominated for oil and gas exploration or drilling, which is the first step in the lease process." For these forests, "New York State shares the mineral rights with the federal government." 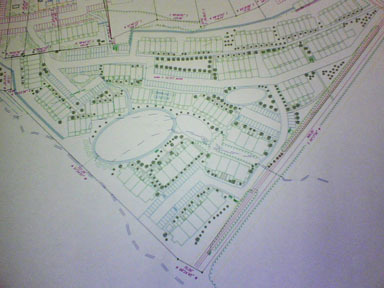 There's also a link to another recently completed plan to get a sense of what they look like. 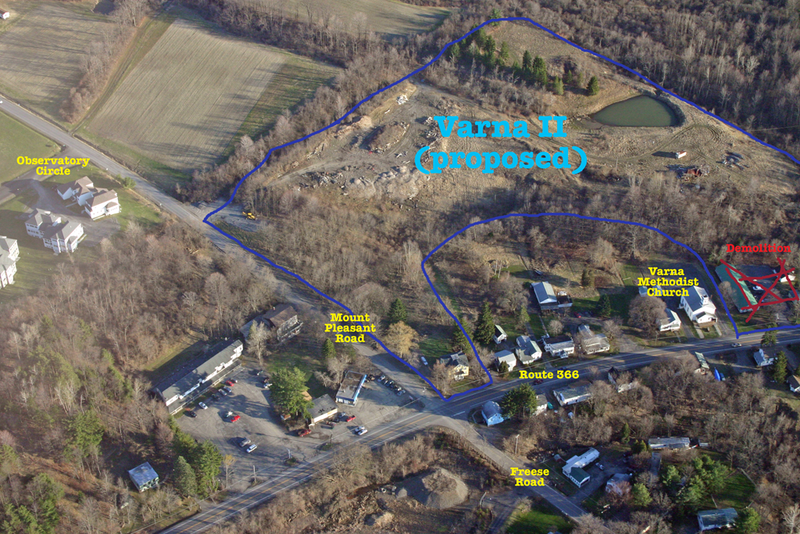 Developer Stephen Lucente and his engineer Lawrence Fabbroni came to the Dryden Planning Board to have an initial conversation about their proposal for building a new development on the southern hillside above Varna along Route 366, running behind the existing houses from Mount Pleasant Road to just east of the Varna Community Center. It wasn't a formal application process, though they did have sketches to show and a rough description of what they were thinking about. I pretty much fell over, though, when they said 260 units, 16 units per acre. Lucente had made a similar proposal about a decade ago, also called Varna II. 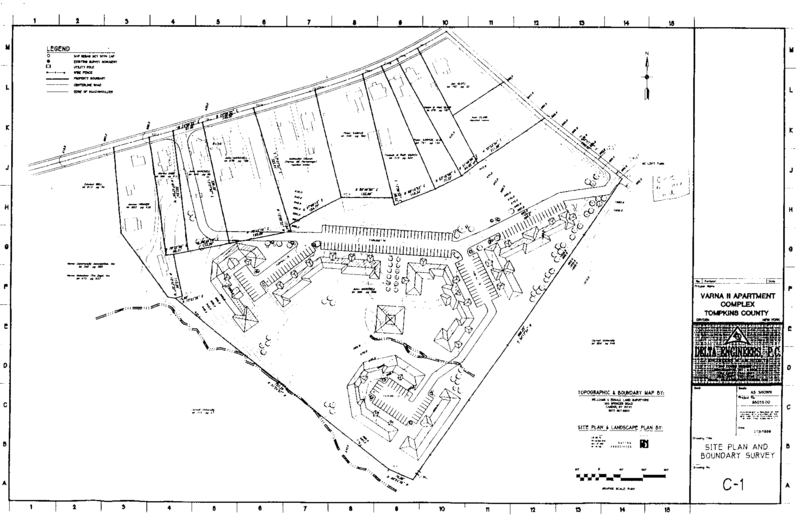 Resistance to that project led to some very deliberate language in the Town Comprehensive Plan about gradual development and limiting development in the hamlets to smaller projects - around 20 units. That language has also made its way into the new drafts of the zoning law, and all I can figure is that Lucente hopes to slip this project through before the new zoning takes effect. Yes, the location has access to water, sewer, and transit, and is along the likely railroad bed trail. And yes, they're working on stormwater issues. They hope to sell townhouse units to homeowners (for $150K to $200K) rather than rent them, and the plan also includes a possible 30,000 square feet of commercial space. They estimate ten years to complete the project, likely in three phases. It's clear, however, that this is not really gradual densification. It's uncertain that the existing sewer system could carry the new load, though Fabbroni did suggest they would consider expanding it if necessary. It's on a slope steep enough to need a 25' retaining wall, in an odd location a ways from the road. And even apart from the question of density itself, the traffic impact of cars coming onto and off of Route 366 during the times that road is busiest raises questions in an area which was just handed a lower speed limit because of traffic dangers. I'll have a lot more on this over time, as I have a chance to digest what was said and to look over the records from the old Varna II proposal. Right now, though, I'm pretty much hoping that this is Lucente's initial offer, presenting something ridiculous he knows will be bargained down. Otherwise, Varna's facing a drastic transformation it's already made clear it doesn't want, or yet another long fight. "[Section 803.5 of Town of Dryden Zoning law states that...]... In no case shall density exceed 10 units per 30,000 square feet." 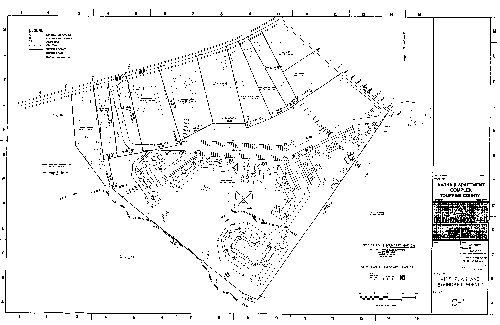 [(12.317ac x 43,560 sq. ft) / 30,000 sq. ft ] x 10 units = 178.8 units. 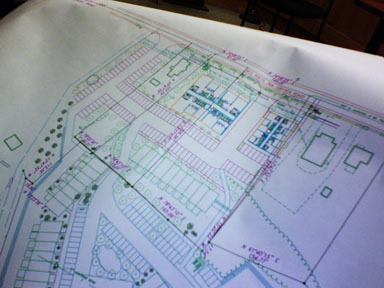 I stopped by Town Hall for a fresh packet of current zoning material, and it looks like Section 803.5 is still active. It's possible that his additional purchases of houses in Varna have increased the total acreage to some extent (to 16.25 acres?) - but they were clearly talking about 16 units per acre last night, and the formula above gives 14.52 units as a maximum legal limit per acre. All I can figure, though I do plan to read the whole zoning packet again to see if I'm missing something, is that Lucente decided to start with a higher number to increase his chances of getting to a high number through negotiation. It may not matter that 260 units was never legal in the first place - it just gives him more ammunition for saying that any reduction is too dramatic. Where would Varna II go? I've had a few people ask me where exactly these 260 units would go, so I pulled out some aerial photos from April 2005 that show the site. I wasn't so good with the camera that I got the entire site in one shot, but the two shots I did get show slightly different aspects of the project. I've drawn the rough outlines of the project on the photos. They aren't precise, but so far as I can tell from the project map, they're reasonably close. The first shows the project in relation to the Route 366-Mount Pleasant-Freese Road intersection. You can see Observatory Circle, another Lucente project, to the left, and 'downtown Varna' in the lower right. Varna II project in relation to Route 366, Mount Pleasant, and Freese Roads (2005 photo). 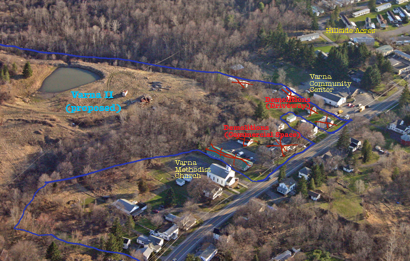 The second photo shows where the project will connect to Route 366, and the demolitions planned for that. Proposed Varna II project connections to Route 366, and demolitions (2005 photo). You can see much larger versions of both photos by clicking on them. There's a lot going on, and the photos are just complicated enough that it's worth a closer look. Builder Bruno Schickel doesn't like the zoning proposal the Town is considering. Did he miss the last twenty years or so of conversation that led to the 2005 Comprehensive Plan? These aren't new issues, and the zoning draft actually softens some of what the plan suggested. The Town of Dryden is holding an informational meeting on the proposed zoning draft at 7 p.m. on March 22 at the Varna Community Center. Dryden residents who care deeply about their hometown's future should educate themselves on this important matter and make their voices heard. You can find the key documents here. If you can get to TC3 tomorrow night for a 6:30pm-8:30pm hydrofracking chemicals discussion, please do, or consider watching the live stream or replays the Ithaca Journal website will be hosting. Also in the Journal, sentencings for Dryden burglaries and a fake Collegetown holdup, as well as a 3.4% drop in sales taxes for the county. But we're (relatively speaking) healthy. Given the "last hired, first fired" policy of most school contracts, it's hard to imagine why Cortland State still has any students in its teaching degree programs. What hope do those young people have of getting--and retaining--a job? In more cheerful news, Cathy Wakeman reports on the Dryden Music Boosters' upcoming jazz and dessert night, a parenting skills class, a report back from Haiti and a concert that raised $700 of relief aid, plus a women's retreat by the Dryden Presbyterian Church. 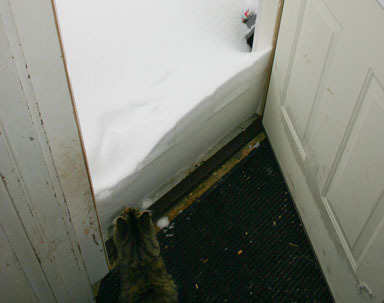 And I think I'm going to try to go out as little as possible for the next few days - wind and snow are on their way. Sounds like it might even happen! 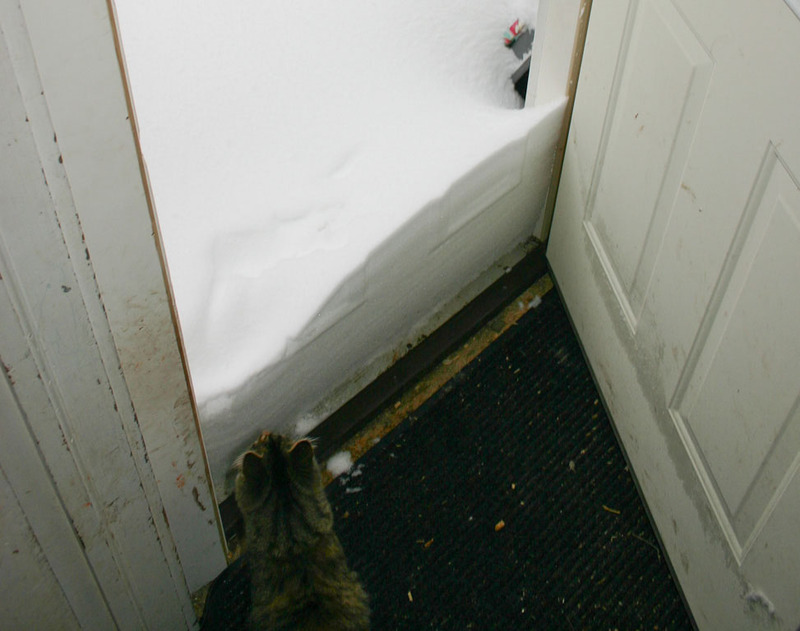 Eilonwy cat marvels at snow deeper than she is.